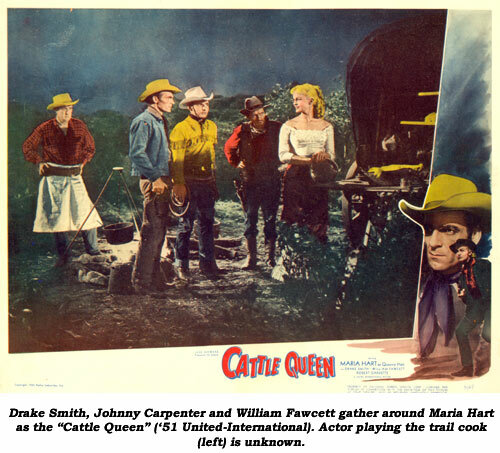 CATTLE QUEEN (‘51 United International) A loose remake of director Bob Tansey’s own “Blazing Guns” (Trail Blazers ‘43) with Maria (“Queenie”) Hart, Drake Smith and Johnny Carpenter filling in for Hoot Gibson and Ken Maynard. 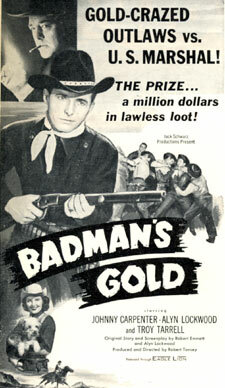 It was the prolific Tansey’s next to last film, he died after making one more, “Badman’s Gold”, with Carpenter. 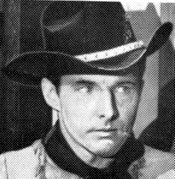 Bland newcomer Drake Smith quickly disappeared after a role in the Rough Ridin’ Kids’ “Wild Horse Ambush” and a “Cisco Kid” TV episode. Maria Hart fared little better with roles in “Border Outlaws”, “Fighting Stallion”, “Outlaw Women” and “The Lusty Men”. Nothing has been heard from either since, and their fate is undetermined. Perhaps the one who prospered most is one of the three convict gunslingers, Emile Meyer, who went on to a distinguished career in many A-westerns such as “Shane”, “Silver Lode”, “King of the Wild Stallions” and dozens of other movies and TV shows. Another of the three imported gunmen is former silent screen Tarzan Jim Pierce. 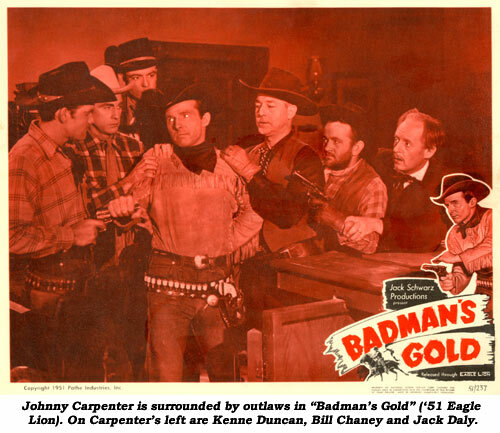 BADMAN’S GOLD (‘51 Eagle Lion) Johnny Carpenter (1914-2003) was the last of the independent shoe-string B-western stars. He never made top-drawer B-westerns, but through all the budget pinching and corner cutting, his love of westerns shows through on the screen. 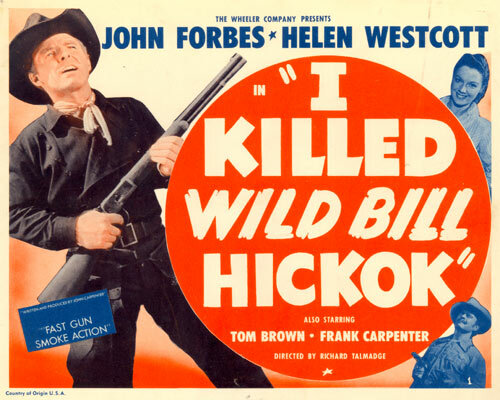 He tried hard, when TV was quickly bringing to a close the B-western screen era, to make decent, exciting westerns. Problem was, Johnny didn’t get started til it was all over. His best is “Badman’s Gold”, with a recycled Bob Tansey story we’d seen first in “Gun Packer” (‘38) with Jack Randall, then as “Range Land” (‘49) with Whip Wilson. Tansey also directs as law pushers Carpenter, Alyn Lockwood (best known as little Mary in Columbia Blondie films), Troy Tarrell (previously known as Clarke Stevens in several Bs) and Daisy the Dog (also from the Blondie series) go after Kenne Duncan’s gang who rob gold from stages, then have a professor melt it down to salt a mine with gold quartz. 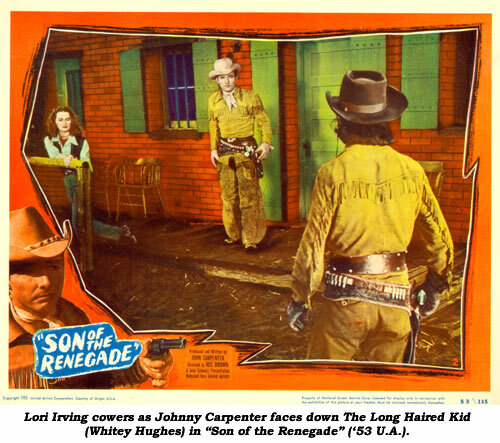 SON OF THE RENEGADE (‘52 Jack Schwarz/United Artists) Only the constant action gives this group of loosely connected scenes deemed “a movie’ any value at all. 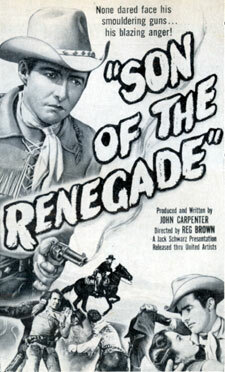 Carpenter, in a dual role (as is practically everyone else in the film), is the son of outlaw Red River Johnny. He only wants to reclaim his father’s ranch but outlaws are blaming stage robberies on Johnny’s return to the Valley. Reg Browne “directed” and tied Carpenter’s mish-mash of ideas together by hiring a voice over narrator to tell the audience what was happening with the wild inconsistencies in the story. Watch for Charlie King and other “badmen” in the abundance of stock PRC footage. Filmed at Jack Ingram’s ranch with Jack in a lead badman role. Forget the cast billing—hardly anyone plays who they are listed as portraying with all of Carpenter’s “regulars” and “buddies” often using their real names: Bill Coontz, Valley Keene, Roy Canada, Bill Chaney, Ted Smile, Whitey Hughes, Ewing Brown and Bill Ward who, incidentally, was the stuntman-owner of the Lone Ranger’s horse, Silver. 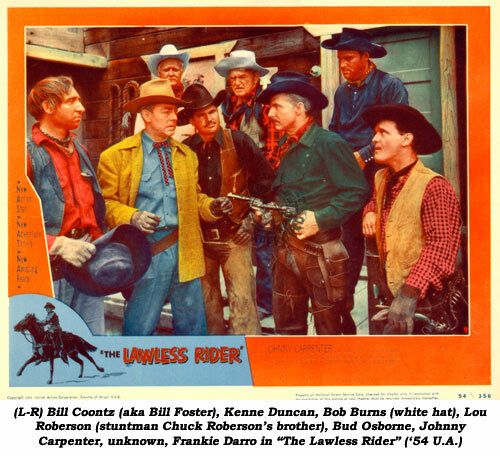 ZERO LAWLESS RIDER, THE (‘54/Royal West/United Artists) Typical low-budget written, produced (with Alex Gordon’s help) and acted Carpenter B, full of bad continuity (with scenes that don’t fit and lend nothing to the story) and amateurish acting. Marshal Carpenter’s old flame, first time actress Texas Rose Bascom (whose accent you could cut with a saw and whose claim to fame down Texas way was fancy trick rope-spinning), is being robbed and rustled blind by town boss Kenne Duncan and his gang. Even Rose’s kid brother, Frankie Darro, is in league with Duncan who sends for more help from hired gunman Rod Tatum (also played by Carpenter). When Johnny takes Tatum’s place all is going well until the real Tatum shows up. Although the screenplay is credited to Carpenter, notorious Ed Wood (“Plan Nine From Outer Space”) had some input, which accounts for the conglomeration of loose, isolated scenes, varied storylines, thoughts, ideas and plot points that go nowhere. Then from left field—a “Let’s put on a music show to raise mortgage money” that consists of a trained dog, bear and crow plus two minutes of Rose’s rope twirling. Best—and oddest line: “You never know what a monkey’s chewin’ til he spits.”(?) Nepotism also enters in—Rose’s real life husband Weldon plays the role of the sheriff as well as doubling Carpenter on a bucking bronc. Weldon’s older brother, Earl Bascom, is also in the mix as one of the outlaws. Both were champion rodeo riders. Weldon, earlier doubled Bing Crosby riding a bucking horse in “Rhythm on the Range” (‘36). Earl later became a noted western artist/sculptor. There’s also some pretty barbaric western music from Hank Caldwell and his Saddle Kings. Main interest here stems from the fact energetic producer Alex Gordon was able to land actors Douglas Dumbrille and Noel Neill for a day’s work as well as coaxing legendary stuntman/action director Yakima Canutt into ramrodding this mess. It didn’t help much. 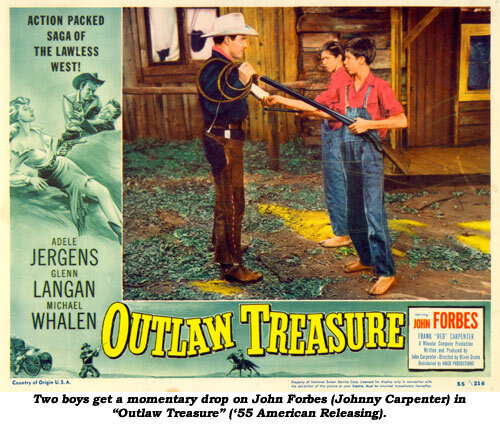 OUTLAW TREASURE (‘55 American Releasing) Semi-incoherent, rambling, disjointed storyline has Army troubleshooter Carpenter finding missing government gold shipments hidden by Jesse James on land belonging to Johnny’s Dad. Typical Carpenter film finish has everyone shooting everyone else every which-a-way. Above average cast for a Carpenter—Adele Jergens, Harry Lauter, Glenn Langan, Michael Whalen, Hal Baylor. Directed with no budget by old pro Oliver Drake from Carpenter’s script. For whatever reason, Johnny was now billing himself as John Forbes while the writer/producer credit still read Johnny Carpenter. 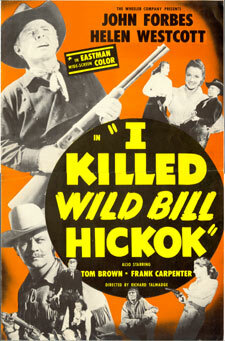 ZERO I KILLED WILD BILL HICKOK (‘56 Wheeler) Forget anything remotely associated with historical fact, this is pure fiction. And not very good fiction at that as crooked Sheriff Wild Bill Hickok (Tom Brown) and horsetrader Denver Pyle create a phony blackleg epidemic that scares all the ranchers into selling out cheap to them. Besides that, Pyle forces wild horse buyer I. Stanford Jolley and his sister Helen Westcott (who is so good in Gregory Peck’s “Gunfighter”) into an exclusive contract with him. That’s when Pyle and Brown run afoul of wild horse trader Carpenter. Typical, ridiculous Carpenter film ending—stand wide open in the middle of the street—“You can’t hit me”—as he guns down 40-50 outlaws! Carpenter’s last, and worst, with bad acting, lame direction (stuntman Richard Talmadge), rambling script with subplots that go nowhere (written by Carpenter himself). Carpenter’s listless voiceover narration doesn’t help either.